Pears or Pear is the name for the tree of the genus Pyrus and the fruit produced. Several species of pear trees produce fruit good to eat because it contains a lot of water, masir and sweet. Pear is the name in English. Fruit Pear-shaped oval, conical, and green and yellow. The pulp is white and has a slightly rough texture. It was sweet and fresh because the water content is high. People have been eating pears for a long time. There is a reason why a pear preferred. In addition to its delicious taste, the fruit is also very nutritious. Fruits are included in the family's apple more fiber than apples. If 1 apple contains 3 grams of fiber, pear contains 6 grams. This means that 1 pear contains 20 percent of the recommended fiber intake to be consumed in a day. Pears are also free of fat, cholesterol free, sodium free, and rich in vitamins C, K, and chromium. Pear has a low glycemic index levels and contains only about 100 calories per fruit. That is, the fruit is good for those who have diabetes and hypoglycemics. Sugar content of foods low glycemic index are absorbed slowly, keeping blood sugar levels stable. 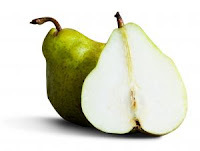 Pears also rich in pectin, a soluble dietary fiber and is believed to lower cholesterol and regulate bowel movements. Therefore, pear very good for those who have constipation problems. The benefits are the biggest pear skin. Therefore, you should not peel pears if you want to eat them. Most fibers are contained in pear skin, including quercetin, namely antioxidants and flavonoids which have anti-inflammatory effects. Although not as much as the substance is held apples and onions, but still a good nutrients from pears. Additionally, pears also has folate, which has been shown to prevent neural defects in infants. So women who are pregnant are advised to eat a pear. Those who have problems with food allergies very advisable to eat pears because it is safe and does not trigger allergic reactions. Pears also suggested as the first fruit given to children as it is considered hypoallergenic. We will pick the pears, choose one that does not bruise (blue because of stumbling), cut off, was brownish, or even that looks young. Pears are ripe enough will feel soft when pressed with a finger. If you are buying a new pear will consume a few days after purchase, choose one that is still hard. So even if you are going to use to be made of cake baked. Pear is ripe to be consumed within a day or two. Let the pears ripen in the air condition room. If you want to make precocious, sandingkan with apples. Apples release ethylene gas into the air, which makes other fruits in the surrounding mature faster. To get the best antioxidant effect, consumption of pears when he was in the mature condition. Because her skin was very thin, be careful if it will bring pears to be eaten elsewhere.